This pattern is for the Hello Kitty that I have made for a wedding present for my best friend’s wedding. 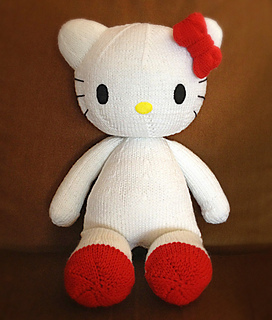 It is designed to match the Elmo plush toy she had given to her fiance. It stands 48cm tall so she’s quite large. A size 00 baby dress will fit perfectly on her. 3.75mm 60cm circular needles/ 3.75 DPN or size needed to obtain gauge. Small piece of acrylic/wool felt in white and red.